Every garage needs shelving to organize the various items used in a household.This could vary from tools, occasional use household items, spares, sporting goods, foootwear etc. SupeRack has two shelving options which are most suitable for a home garage or workshop. SupeRack longspan shelving solution offers great flexibility in terms of height length and bay widths. Designed to hold higher weights between 440KG to 720KG per level, they offer the best solution for storing the heaviest of loads like batteries, tools, surplus tiles etc in a handyman’s home garage . SupeRack longspan shelving come aesthetically finished light grey colour. Longspan garage shelving come in 3 heights, 5 lengths, 4 depths and 18MM particle boards. 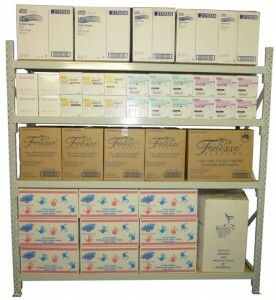 Please refer to the Longspan Shelving page for more details. 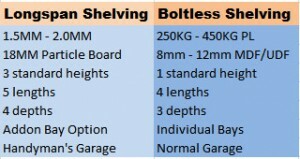 SupeRack boltless shelving is a commonly used garage shelving solution. The garage shelving units can carry loads between 250KG to $450KG per shelf level. More Economical than longspan shelving, they are best suited normal household garage. Our boltless shelving come in a pleasant beige colour. Boltless shelving units come in standard height of 2135MM which can be cut to suited height, 4 lengths, 3 depths and 8MM/12MM MDF/UDF boards. Please refer to the Boltless Shelving page for more details. 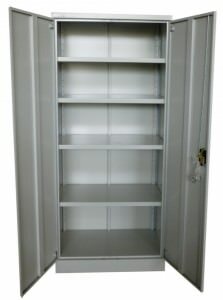 If closed type garage shelving is needed, our SpaceWise range of steel cupboards and lockers would be ideal. It gives an elegant look to your garage while protecting against dust and damp. Extra storage shelves are available any time. 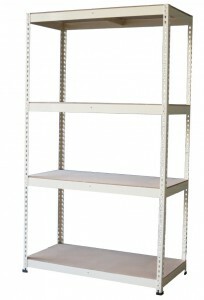 We ship our garage shelving Australia wide for reasonable prices. Call us on 02 9482 4288 or fill the contact form below for a no obligation discussion and quote for your garage shelving units.